Dar-Hao Chen, Cindy Estakhri, Xudong Zha, "Material, Design, Construction, Maintenance, and Testing of Pavement"
This Geotechnical Special Publication contains 28 peer-reviewed papers presented at the GeoHunan International Conference: Challenges and Recent Advances in Pavement Technologies and Transportation Geotechnics, which took place in Changsha, Hunan, China, from August 3 to 6, 2009. 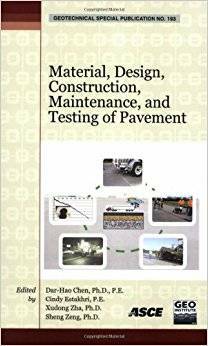 This book addresses a variety of issues in pavement engineering, along with the very latest research in areas such as materials, design, and construction. Investigations and solutions from scientists all over the world in the United States, China, Taiwan, Pakistan, Turkey, Korea, Algeria, and Saudi Arabia are included in this volume, which seeks to expand the range of tools that are available to engineers and scientists in geotechnical and pavement engineering. Topics examined in these papers include: warm mix asphalt, material characterization, pavement performance modeling, and pavement testing and evaluation. This book will be valuable to geotechnical and pavement engineers, as well as to professionals and practitioners involved in highway construction. Ranking: Moderate.